Programmable total loss ignitions allow precise control of timing curve and RPM limit. New digital electronics and waterproof housing provide reliable operation. Powerful multiple sparks ensure complete combustion and will even fire a fouled plug. 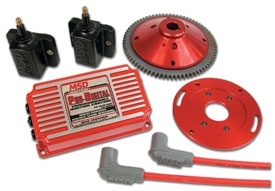 Kits come complete with digital ignition unit, lightweight flywheel, trigger plate, trigger pick-up, ignition coil, and helicore spark plug wires. IJSBA Superstock legal.